The variation on the theme for the W.A.R. I selected was 'tragic' - in this case, the total retreat into self that occurs after a loss. The character is fading into themself, becoming still and more like a painting in oils than a human being. Only when they reach heaven will their masterpiece be sung. It is, truly, the end of all hope. Resources: sxc.hu, Tama-neko, lyrics from End of All Hope by Nightwish. For more resolutions, please visit PxAE. No, I'm not dead. Sorry. Excellent, the text may be a little small and useless but overall this is a wonderfull piece, one of the best WAR walls. I still love this wallpaper, great work. I like the wallpaper, even though there are a tad too many textures, I guess that adds to the art of the scan. Yoshitoshi Amano art is overrated nowadays, with really bad wallpapers popping up everywhere ... but you proved me wrong that there can't be any good walls with such complicated art. Hello... 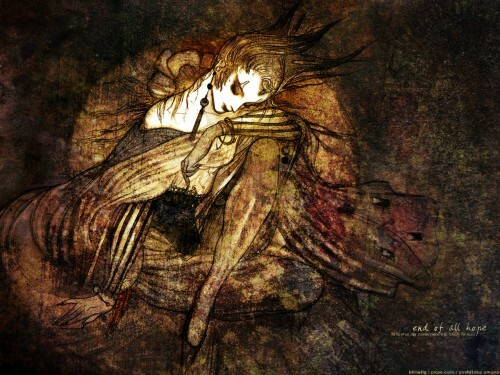 I saw the thumbnail on Kuroimisa's website... and I wondered... "Doesn't this look like Amano?" And yes... really... :) I love Yoshitaka Amano's art... I also tried making wallpapers using his paintings... I think it is very difficult to do... so I am always happy when there are people who are making really good wallpapers of Amano's art. woooo this looks cooL! =D i like the use of colour in this one...mmm...very morbid...cuper work! these textures are awsome. beautifully done! Wonderful! You captured a lot of depth by making the texture fade into the scan, focusing the eye. Adding the light around the character also help to have a focus, I think those two things keep this very texture heavy wall easy on the eye :D Big fav! Yoshitaka Amano's art is definitely not one of the easiest to wall, but you have managed to be victorious here. I really like the way you accentuated the sad face of the character and I find the title well-matched. Somehow grunge is not my favourite style of walling, but here it definitely adds to the depth of the work. Well, it looks as though I'm going to have to put you on my watchlist now... Finally broken into the Amano walling scene, hm? Well, it's a good time for it, what with Arete coming up. This is an excellently done work, though very simple for an Amano piece. I'll have to comment on it properly tomorrow (or very soon thereafter), when I'm not dead tired. Very nice work, I've added to my favorites. It's hard to explain the feeling I get, but very few works effect me in such a way. Thank-you for posting, I guess I will need to go through the rest of your gallery when I get the chance and see what I have missed since I've been away. Love the scan, and love the bg you made to go with it, especially the color and the effect... I,m not really familiar with Yoshitaka Amano's art, but every piece i've seen so far we're awesome, i should probably go check the gallery someday ^_^' i love how only the face of the character is really accentuated by being so pale... as for the lyrics, i like them, but i find they would have been better placed at the top right of the wall, which looks a little empty... oh well, still a very great looking wall, awesome! weird colors which make a really good combination with that image. this is a Femme fatale wallies... u can resemblance of the posture of the woman, is just perfect too. the sepia colors kinda add some misterous way, and so much... i dont know... i just know is beautiful, and weird too. So gorgeous! This wallie is special!